We will learn a cluster known as galera cluster today. There are 3 Galera versions (Codership, Percona XtraDB Cluster and MariaDB Galera Cluster). We will pick MariaDB galera cluster. But what is MariaDB Galera Cluster? 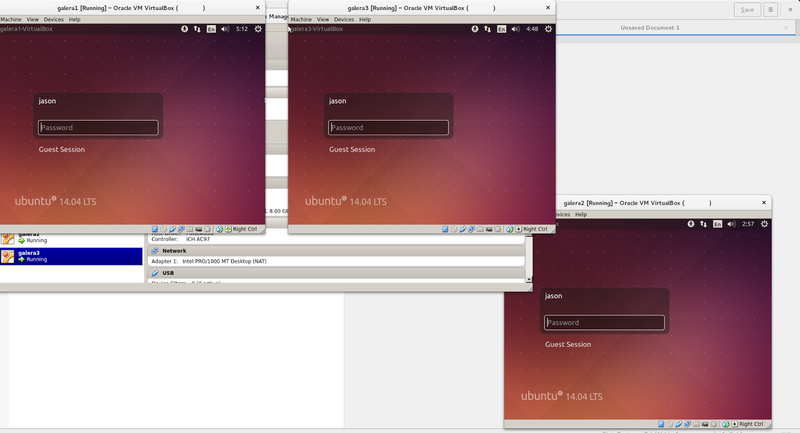 For this, I have setup 3 virtual machines in the host ubuntu. The virtual machines are using ubuntu 1404. The network settings for this devices are bridge to my host network card and so I can access these vms remotely via ssh. This tutorial primarily is reference this and this. If you want explanation, please read the links mentioned before. I will quickly demonstrate what actually is galera cluster in few minutes. Below shown are apt update on node 2. We then install package python-software-properties and add the mariadb galera package repository. You should repeat these steps on all 3 nodes. 0 upgraded, 2 newly installed, 0 to remove and 48 not upgraded. After this operation, 352 kB of additional disk space will be used. 0 upgraded, 15 newly installed, 0 to remove and 48 not upgraded. Selecting previously unselected package libaio1:i386. Selecting previously unselected package mariadb-client-core-5.5. Selecting previously unselected package mariadb-client-5.5. Selecting previously unselected package mariadb-galera-server-5.5. Selecting previously unselected package mariadb-galera-server. 150907 23:31:58 [Note] Plugin 'InnoDB' is disabled. 150907 23:31:58 [Note] Plugin 'FEEDBACK' is disabled. 150907 23:32:00 [Note] WSREP: Service disconnected. 150907 23:32:01 [Note] WSREP: Some threads may fail to exit. Package mariadb-galera-server-5.5 is not configured yet. At this stage, it is okay if it fail as we have yet to configure the cluster configuration for each node. Just ignore the error message and stop the mysql instance in all the nodes if it started. Next , we will configure in each node for the configuration files. There are two files to edit for all the nodes as of following. The content of the files can be found here. Once all three nodes configuration files edited, you start a node with this parameter --wsrep-new-cluster . You can see above I started on the first node. Then start the remaining nodes just like normal mysql start process. As you might noticed, mysql cannot stop in my virtual machine. I have no idea why is that as on my good old host machine, with three vms running make these vms crawling.. I don't bother to investigate further and just want to quickly get into the database crud. But eventually all my three nodes are started and see below. If this excite you, then you should probably spend more time to learn how to administer and how to best use mariadb galera cluster. Last but not least, if you would like to sponsor/donate for me or this site, please do so as this this fund will channel into server maintenance and buy better hardware for my learning and share to you in future. We will do something fun today. But you will need a router which has the feature universal plug and play . 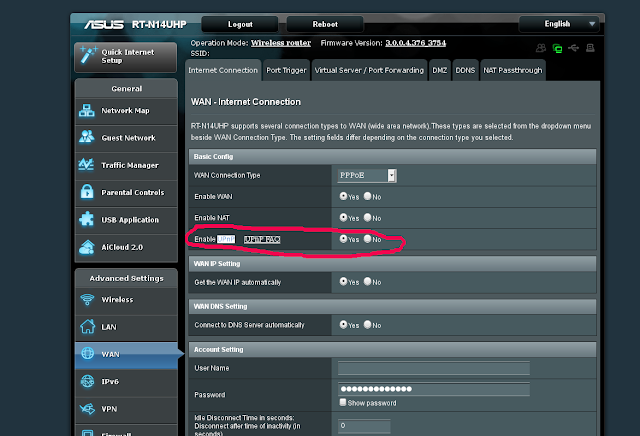 In this article, I will use Asus router RT N14UHP for this demo. Login to your router and locate the UPnP setting. Go to WAN then on the basic config, click yes for Enable UPnP. See screenshot below. Next, get this script from github. See command line below which I have experience myself. As you can read above, the script is downloaded and then permission is set accordingly. Noticed that UPnP is found on my router on port 42917. Then you can instruct the router to port forward, in this example port 1337 to an internal of this machine. In this example, my local ip is 192.168.133.1 and the application is running on port 9999. Now, to simulate this work, you can use command nc to listen on port 9999. To test if this work, just get your public ip and telnet to your router on port 1337, your router should forward this traffic to internal machine 92.168.133.20 port 9999. As you can also see above, when telnet is done, nc port listen is also closed. That's it. Have fun port forwarding! c or c++ is not my programming language but due to the fact that I got nokia n900, so this project interest me so I thought of spending sometime to compile this project. Today, we will do just that, to compile the source for nokia n900. Let's get started by cloning the repository. remote: Counting objects: 4280541, done. Receiving objects: 100% (4280541/4280541), 879.23 MiB | 416.00 KiB/s, done. Resolving deltas: 100% (3609411/3609411), done. Checking out files: 100% (49721/49721), done. As you can read above, the source file size are big, 1.7GB and so it take sometime here to finish the download. Okay, now we will compile kernel for n900 using the instruction found here. With the error above, it looks to me that the compiler is not install. So I have install this package, as show below. 0 upgraded, 17 newly installed, 1 to remove and 323 not upgraded. Need to get 20.6 MB of archives. After this operation, 80.3 MB of additional disk space will be used. Selecting previously unselected package gcc-5-arm-linux-gnueabi-base:amd64. Selecting previously unselected package cpp-5-arm-linux-gnueabi. Selecting previously unselected package binutils-arm-linux-gnueabi. Selecting previously unselected package gcc-5-cross-base. Selecting previously unselected package libc6-armel-cross. Selecting previously unselected package libgcc1-armel-cross. Selecting previously unselected package libgomp1-armel-cross. Selecting previously unselected package libatomic1-armel-cross. Selecting previously unselected package libstdc++6-armel-cross. Selecting previously unselected package libasan2-armel-cross. Selecting previously unselected package libubsan0-armel-cross. Selecting previously unselected package libgcc-5-dev-armel-cross. Selecting previously unselected package gcc-5-arm-linux-gnueabi. Selecting previously unselected package gcc-arm-linux-gnueabi. Selecting previously unselected package linux-libc-dev-armel-cross. Selecting previously unselected package libc6-dev-armel-cross. Now, I re-issue the command to compile the kernel. The error previously has gone and all the modules were compiles. I supposed the compiles were complete. It would be great if anyone can comment on how to move this compile codes into the phone. Please leave your comment below.